Everyone is being fooled by their own nostagia. The animation is lame, sound is regularly fair and story wise... its just ok. Instead of finishing the best thing that happened to Saint Seiya which was Lost Canvas, they come up with a nostalgic saga, just to grab some more money from the nostalgic fans. The best saga in every aspect still is Lost Canvas. Story-wise it's okay and it is always a great pleasure to follow the gold saints adventures.. Yet animation-wise it is quite poor. The characters sometimes look like they were drawn by monkeys at times. The voice-over for the gold saints is definitely C- compared to Lost Canvas or Hades arc. Finally, the cosmos have answered the call! Been looking forward to the "next chapter" of the Saint Seiya series for a while, and judging by the first episode, this one does not disappoint! It's an original story that propels the heroes we know and love into a new world, against new enemies-- while keeping the animation style and action that we all fell in love with in the original series. I don't normally rate a series until it's complete, but I'm giving this one 5 stars now, in the anticipation that it's going to be great. I'll change my review later if the series takes a dump, but I'm hoping it doesn't! My top 3 childhood anime brought back with believable story! This picks up directly from the main story arc. I'd like to say after the Hades arc and the plot is well put out since we see most the gold saints giving their lives to destroy the wailing wall in the Hades arc. This is not that Omega crap or Tenma one with predictable outcomes at the beginning of every episode! This is the real deal! The graphics have slightly improved compared to the 90s series of course! If you are a fan of the Saint seiya series, this would be something you would definitely enjoy! The Gold Saints are back! And better than ever! 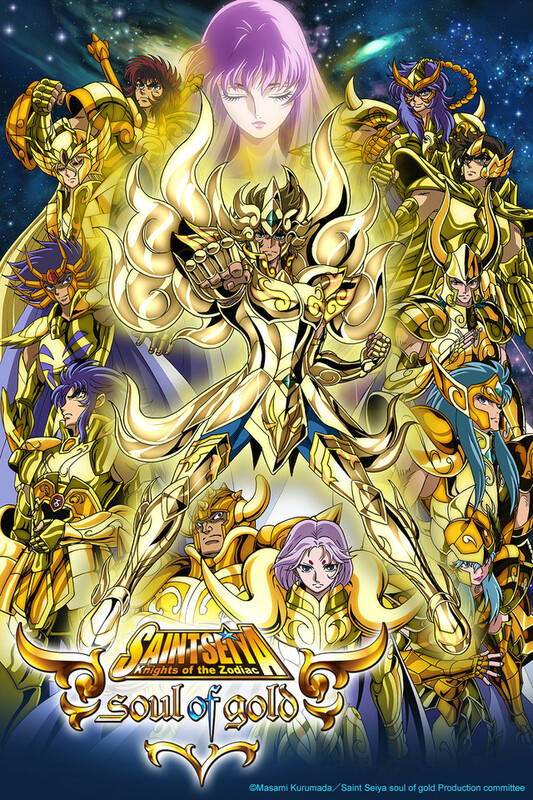 The Gold Saints are my favorite part of the original Saint Seiya, so to have an anime just about them is like a Godsent, or should I say Athenasent. lol Furthermore, it features my favorite of the 12 Gold Saints, the Leo Gold Saint Aiolia! With a new God Cloth! This is definitely my favorite anime this season, and I look forward to watching the rest. I love this Anime !! Remember that episode of Yugioh, where Valon used his awesome Armor cards against Joey with his red-white armor? So imagine that but expanded upon into 12 episodes rather than 2 or 3. This anime is literally one big battle royale between the Gold Saints of Athena and the God Warriors of Odin. Like your everyday "VS" anime where these two groups of people go at it non-stop until the very end where they then decide to work together in order to face the real threat that is going on. Really, its just an anime meant for fanservice- giving us a good amount of awesome character designs and fights while retaining very little story. The animation is alright, nothing too special about it. Overall, if you like action, adventure, with tons of fights- go watch it. I wanted Saint Seiya, and I got it. Here is the thing: when it comes to Saint Seiya, I only really liked the original show. That is not to speak about the quality of its spin offs. I understand that Lost Canvas is by far a better constructed narrative. I can accept that. Still, it is not the Saint Seiya I love. Because the Saint Seiya I love has very specific flaws that gives it it's unique flavor. And oh god, does Soul of Gold has those flaws. But as I said, I love it for them. This is old school. Soul of Gold doesn't care that decades have passed since the original Saint Seiya concluded, and that modern anime just doesn't work the same way. Is full on nostalgia. But not in the "let's use the name of something old" kind of way, but in the "let's do things the old way". And it shows. And many will not like it, and for good reason. I? Well, I've watched Saint Seiya for over 20 years. And it's the first time a spin off really feels like the original show. If that is what you are looking for, I can only recomend. Also, note that this is basicly a reunion special for the gold saints. You need to be a fan of them to really enjoy it. Great watch. Story is ok, but not deep kind of slow at times. I've not seen the earlier series but after seeing this I'm quete intrigued. Got to say, its not the deepest story as in content and at some parts it feels like over extending a scene (as in dragon ball) but in the end still great watch. I don't know if the earlier series had the same thing going but the "Special" moves where pretty reppetetive.